This summer I've been searching the flea market for transistor radios and radios otherwise having ferrite loopstick rods or bars. The occasional portable or tabletop transistor radio is to be found, sometimes at a cheap-enough price. Most use ferrite rods or bars for their antenna, though the maximum length found is usually not more than 4 inches. An old Japanese transistor radio from the early 1970s was procured early in the summer from the flea market. It did not work. Though I tried, I never was able to get it to work, but it had a nice 4-inch ferrite bar in it with intact coil. The miniature variable capacitor was sturdy and in good shape too, and it had a perfect little plastic clip which could be used to attach the capacitor to the bar. I decided to put the two together and make my own miniature "Q-Stick", so I disassembled the radio, removing these parts. You see the result in the accompanying photos. The variable capacitor and clip were mounted to the bar, then the coil wire ends were soldered to the variable capacitor. Tuning is fairly sharp, particularly at the high end of the band, and I found it tunes the entire mediumwave broadcast band without problem. 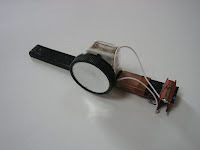 The resulting assembly can then be placed or held near a radio containing a loopstick antenna. The signal picked up by the tunable bar is inductively coupled to the radio's internal loopstick, increasing signal strength. Rotating the tunable ferrite bar produces a sharp null just like rotating the radio itself, and used in combination with the radio's nulling ability can produce some interesting results. My ultralights all have very short loopstick antennas, generally not much longer than 2-inches, so the 4-Inch Tunable Ferrite Bar does improve signal pickup quite dramatically on these units. So, if you have an old transistor radio around that doesn't work anymore, don't throw it away. 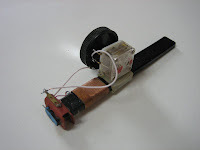 You might be able to make your own tunable antenna accessory.